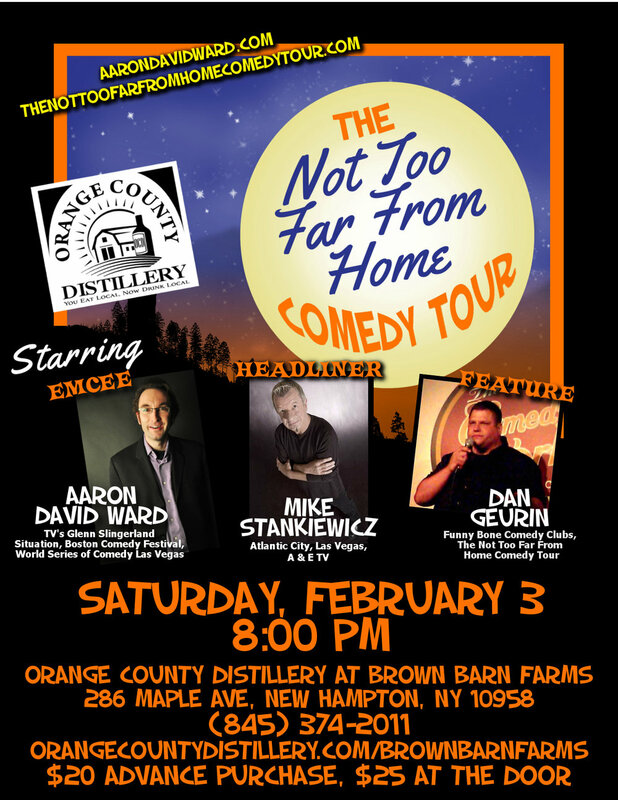 (New Hampton, NY) -- The Not Too Far From Home Stand Up Comedy Tour stars comedian Aaron David Ward and his hand-picked fellow comedians who work throughout the Northeast and Midwest on a tour that truly is “not too far from home.” All the comedians either live in or have ties to upstate New York and have been performing professionally for years. Join Aaron and the other rising stars in the professional stand up comedy world for a night of laughter. Comedian Dan Geurin recently launched his comedy career at the tender age of 42 and already has racked up an impressive list of accomplishments including winning comedy contests and performing regularly at The Funny Bone Comedy Clubs in Albany and Syracuse, NY, The Comedy Works in Albany, and Saratoga Springs, NY and throughout the Northeast. has entertained audiences from New Hampshire to California by getting them to laugh and think at his self-deprecating, socio-political, and culturally critical comedy. He opens his heart, mind, and soul to fans during each trip deep inside his mind for a funny, honest, and twisted look at his concerns, disappointments, doubts, fears, and worries. You get to see a tug of war between the emotional and intellectual brains when Aaron is on stage. Aaron has performed throughout the Northeast and Midwest, appeared in the Boston Comedy Festival, Plymouth Rock Comedy Festival, Cape May Comedy Festival, and in several movies including What I See In The Dark and Aftermath as well as a pilot for MTV and VH1 entitled The List. If you are a fan of funny, introspective, and smart stand up comedy, then Aaron David Ward is your kind of comedian! See Aaron on The Not Too Far From Home Comedy Tour coming to a city, town, and village near you soon!